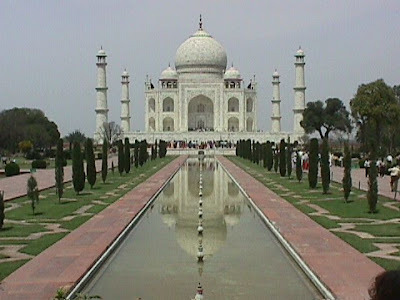 The Taj is probably the most important and well known Indian monument. It is also India’s identity abroad. It is a symbol of love and portrays grace and elegance rather than Power in sharp contrast to the other architecture of that era. It is poetry and prose in marble. The best part is that the monument is still alive; it is not in ruins, getting dilapidated or reduced to just another monument in the heritage list. Words, pictures and videos are not enough to describe or even feel the majestic grandeur and the unparalleled beauty of the monument. The magic created by the evening light transforming the structure in a myriad of colors of different hues is mind blowing. Most Indians of my generation and probably a generation up and down grew up with a misconception that Taj was one of the Seven Wonders of the World. I am sure that like me all my contemporaries were also disappointed as and when they came to know the truth and wondered why. How was such a marvel left out of the wonders of the world? There was nothing we could do about it. But the wait is over. We now have the perfect opportunity to redeem our debt to this magnificent glory of our country. The new7wonders (N7W) foundation has initiated a global campaign to select the new Seven Wonders of the World. The foundation has short listed 21 structures based on criteria like time span, structure quality, dimensions etc. The selection of the final seven will be done out of these 21 short listed monuments purely on a voting system. The voting can be done online, by SMS or by certificate voting. The voting online process is fairly simple. Just logon to http://www.new7wonders.com/index.php?id=351&L=0 and follow a three step process. This is a perfect opportunity for the people, in India and abroad, to show their love and support to this beautiful and magnificent monument and bring it to the forefront globally. Let one and all, Indians and foreigners see and feel this beauty and grandeur in its natural environment. It’s sad to note that so far Indians have not risen to the occasion. Therefore, I wish to make this sincere appeal to all people who have seen the Taj or know of it to please make your voice heard and vote for it now. I have done my bit and have put my vote. Just look at this monument above and feel the love and sadness, the riches and the poverty, the power and the helplessness of the man who built it in the memory of his lost love. It deserves to be one of the Seven Wonders of the World. Go!Vote for it now. Just 42 days left to make your vote count. So do it now. The Taj still needs over 30 crore votes to make it to the list! Make History: Vote for the Taj.